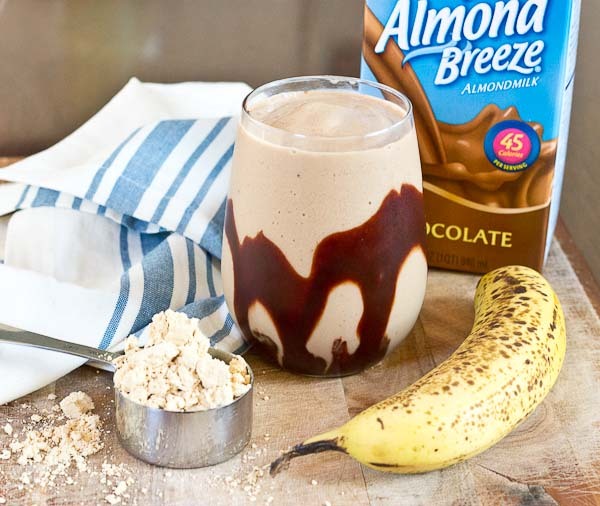 This Chocolate Peanut Butter Protein Smoothie recipe is sponsored by Almond Breeze. 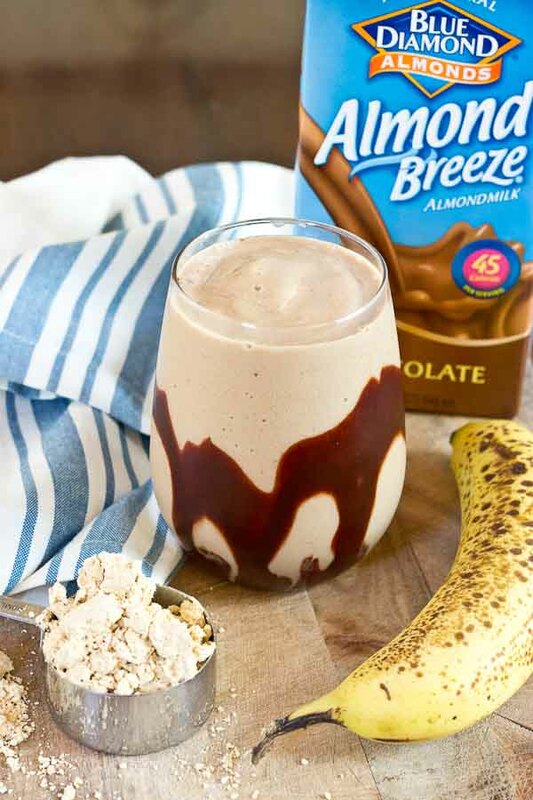 Chocolate Peanut Butter Protein Smoothie…a chocolate lover’s dream. 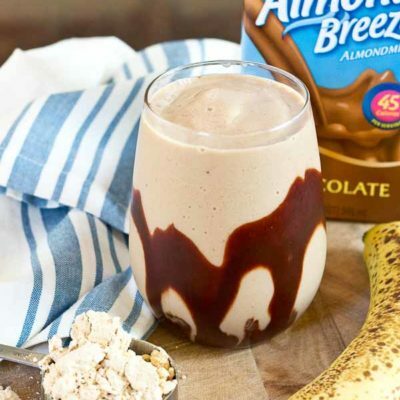 Sweet, creamy, high protein, no added sugar, and made with only 3 ingredients! I know, I’m smoothie and shake crazy. But they are just so good and simple. I love whipping up a smoothie for breakfast or snack or dessert for that matter. In fact, I’m known to make a smoothie for dinner if Eric is out and not coming home for dinner. Less fuss and mess to clean up. I’m simple like that. Anyway, in DC while he was in seminars and taking the exam, me and my baby bump trekked it around the city. We’re talking 9-13 miles a day X 4 days. I LOVED all the walking… but with this heat and 20 additional pounds around my midsection and the achy feet, I didn’t really know how to dress and not look like a total tourist. This mama MUST wear tennis shoes at this point. #ohpregnancywoes I literally took a minimum of 3 showers a day because I was constantly sweating. Let’s just say, I was happy to come home to the afternoon rain and continuous AC. Anyone else ready for cooler temps? Hands raised high over here. 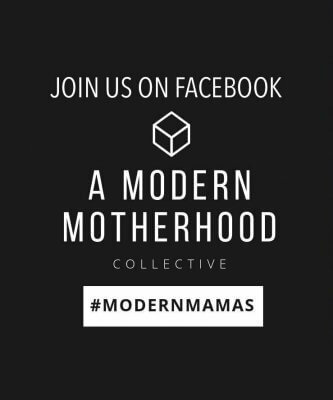 The only thing is cooler temps for me also means a newborn and a new business for my husband. It’s going to be a CRAZY fall. 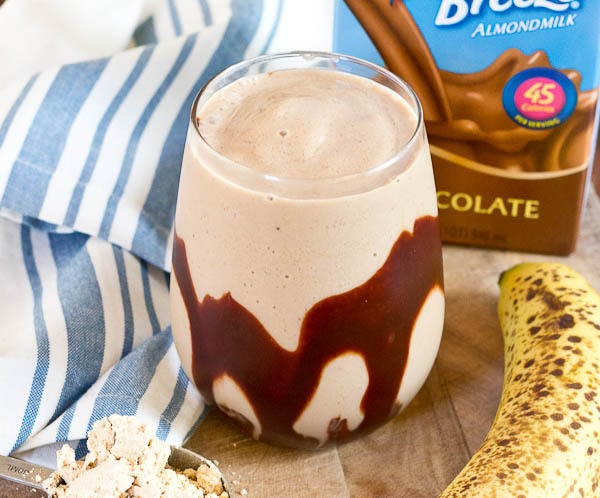 Go cool off with this Chocolate Peanut Butter Protein Smoothie. 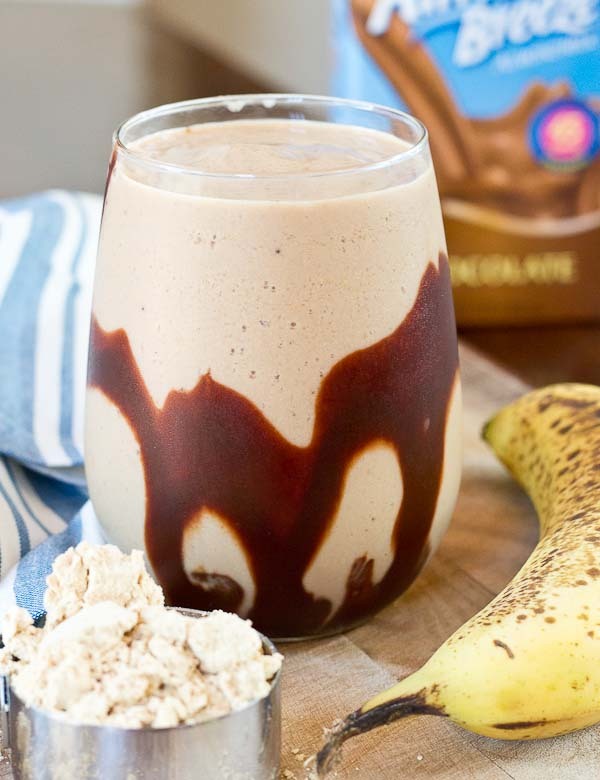 Chocolate Peanut Butter Protein Smoothie…a chocolate lovers dream. 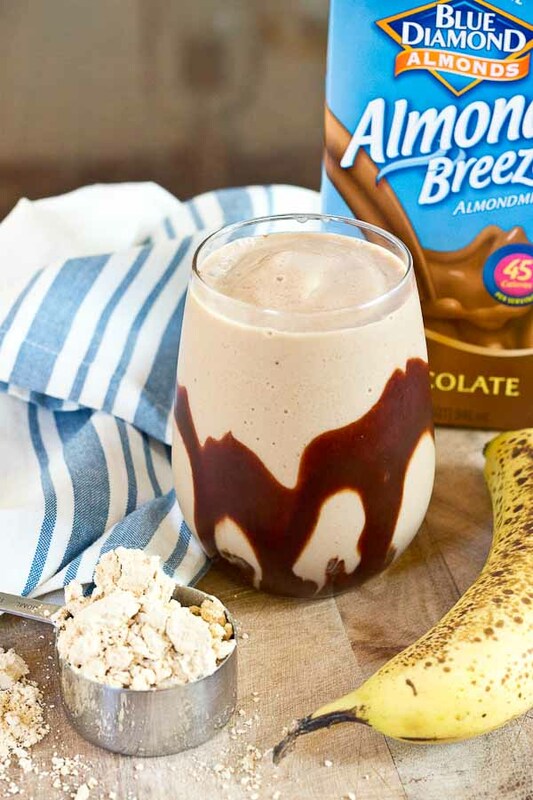 Sweet, creamy, high protein, no added sugar, and made with only 3 ingredients! Place all ingredients in the blender and process until smooth and creamy. Can’t wait to try this later. Thank you so much for sharing! I’m a smoothie freak as well… I have one for breakfast every morning! Love your recipe.. but where did you find the unsweetened chocolate almond milk?! I buy unsweetened vanilla for mine, but I don’t think I’ve ever seen that anywhere! It’s hiding in the shelf stable milk section! Oh gosh- I’m 27 weeks pregnant and kind of want this right now at 8:30pm- I may be heading to the store now for chocolate almond milk! Also- my husband took that test a couple years ago and is now an NFL agent for his brother! Awesome for you guys! Good luck on the last leg of your pregnancy too! Chocolate almond breeze I always have in the fridge so this recipe is one I will be making tomorrow for breakfast! This might be a silly question though – why peanut flour or powdered peanut butter? Why not the real creamy delicious peanut butter? (That admittedly I have stocked enough of in case the world ends, I’ll be okay.) Too much sugar? Or simply a better blend? And please don’t worry about another smoothie recipe. I love them all. I always come here first when I’m looking for new ones! Not a silly question. Peanut flour has no added sugar and is a little higher in protein than powdered peanut butter, so peanut flour is the preferred choice but it can be harder to find. You can totally use the creamy peanut butter it will just be higher in calories and fat//and much lower in protein and fiber.. I didn’t test this out though. If you substitute creamy PB I’d only use 1 tablespoon instead of 6. Hope this helps 🙂 Glad you like the smoothies!! Awesome recipe! I am also a sports RD and this would be a great cooking demo recipe for our athletes. Thanks Courtney! I didn’t think of that but you’re right. A great way to boost protein intake too without using protein powder that are often slammed with sugar. chocolate and pb, enough said! 🙂 This looks superb! 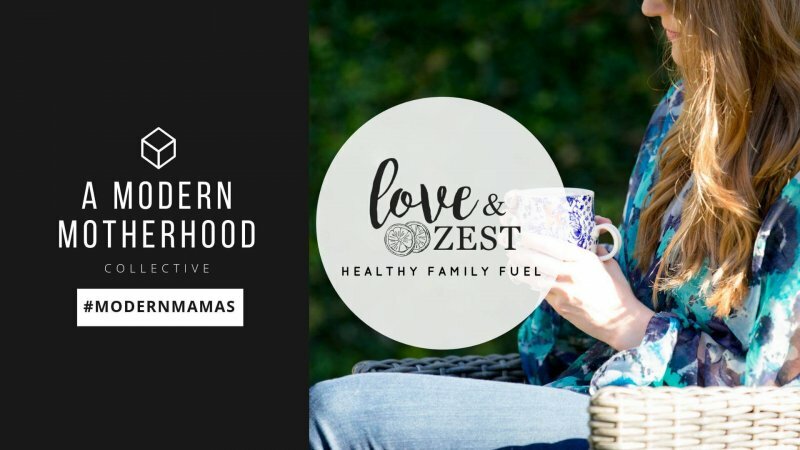 Hi fellow Central Florida blog sister!! 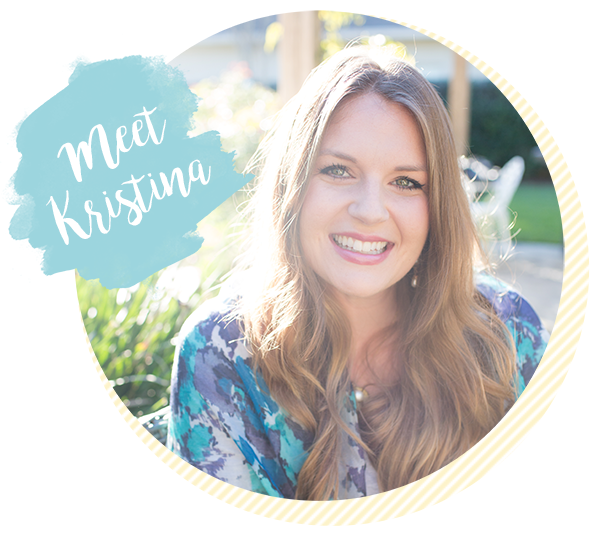 Dropping by to show you some love and I loooooove your blog. And this smoothie! We are a dairy-free family so it’s perfect for a sweet and tasty treat. Putting on Pinterest now!! It’s super hot there right now… we did have some breezy mornings. I definitely miss all the walking! Oh this has my name all over it!